To quickly see how numbers in selected cells add up, take a look at the status bar below your spreadsheet. 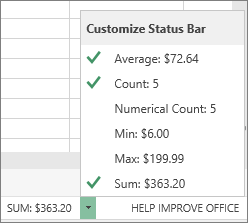 When you select two or more cells that have numeric data, Excel Online automatically summarizes that data and shows the average, count, and sum on the status bar. 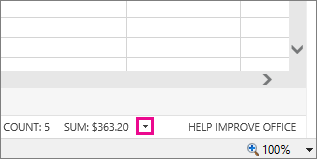 These summarized values update immediately when you change values in the selected cells or select a different range of cells. In the status bar, click the arrow next to the last status bar entry. In the Customize Status Bar gallery, pick the status bar entries you want. A check mark appears when an entry is selected. To deselect entries, click them again to remove their check marks.